On April 5, we had our third day of negotiations using the Interest Based Bargaining (IBB) model. We had collaborative discussions and are making good progress. We addressed the Staffing Committee, work week, SANE and workplace violence. Our next dates for negotiations are April 16, 29, and May 16 and 17. 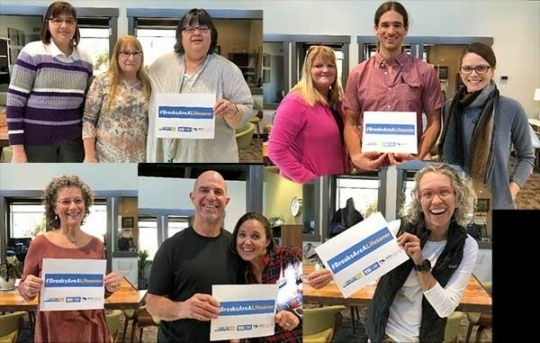 Our team members are Susan Chapman, Judy McBride, Samantha Goff, Crystal Clabaugh, Stefanie Gates, Lorna Sebastian, Michele Rae, Amanda Cortes, Nick Jackson and Paul Molenaar. On March 26, we had our second day of negotiations using the Interest Based Bargaining (IBB) model. We had collaborative discussions and are making good progress. We addressed vacation, transition for nurses going into pool positions, PTO cash out and notification (in article 8.4). We reached an agreement to resolve our payroll grievance that was scheduled to go to arbitration. More information coming on this. We agreed to extend the contract through May 31. Our next dates for negotiations are April 5, 16, and 29 and May 16 and 17. We met with management on March 5 and 6. The first day of negotiations was an Interest Based Bargaining (IBB) training with the federal mediator. We had a successful collaborative session on March 6. Our next session is scheduled for March 26. Our negotiation team members are Susan Chapman, Judy McBride, Samantha Goff, Crystal Clabaugh, Stefanie Gates, Lorna Sebastian, Michele Rae, Amanda Cortes, Nick Jackson and Paul Molenaar. If you have any questions, contact a team member or WSNA Nurse Representative Carmen Garrison at cgarrison@wsna.org. A special thanks to Susan Chapman and Judy McBride for all the years of leadership they have given on our behalf. We wish you all the best. We are still working on dates for our upcoming negotiations. Questions? Contact a negotiation team member or WSNA Nurse Representative Carmen Garrison at cgarrison@wsna.org. Have you mailed in your ballot? We currently have not received any completed Officer Election Ballots. The WSNA office will be closed the week of Christmas and New Years Day. We are extending the postmarked date to Jan. 3 and will count the ballots during the week of Jan. 7. If you have not received your ballot, please contact Carmen Garrison at cgarrison@wsna.org. Plan on attending the local unit meeting on Tuesday, Jan. 8 or Thursday, Jan. 10 from 5:30 to 8:30 p.m. in Conference Room J at the hospital. Questions? Contact WSNA Nurse Representative Carmen Garrison, BSN, RN at cgarrison@wsna.org. It's time to start prepping for negotiations. Thank you to those who completed the survey – that was step one. Now we need to meet with you. These are drop-in style sessions. Questions? Our nurse rep is here to help: Carmen Garrison, BSN, RN at cgarrison@wsna.org. It’s time for elections. If you are a member in good standing, you should receive your local unit ballot in the mail. Please look out for this very important document. The ballots must be postmarked by Dec. 21. Our outgoing officers are Judy McBride and Susan Chapman. Remember to thank them for their many years of service advocating for all the nurses at Central Washington Hospital. If you have any questions, please contact WSNA Nurse Representative Carmen Garrison at cgarrison@wsna.org or 206-491-9424. Did you receive a call for nomination form? It has come to our attention that some of you may have received an empty envelope from WSNA. It was supposed to include the call for nomination form and a self-addressed envelope. If you received an empty envelope from WSNA, please contact Carmen Garrison immediately at cgarrison@wsna.org. We apologize for the inconvenience. Thank you for your commitment to selecting your local unit leaders. We are recommending a YES vote. Read the LOU here. If you have any questions, feel free to contact Carmen Garrison, our WSNA nurse representative, at cgarrison@wsna.org or at 206-491-9424. It’s that time again for local unit officer elections. You’ll be receiving a call for nominations form in the mail. Please complete and return the form as soon as possible. The last date for postmark is Nov. 9. You can nominate yourself or anyone who has shown an interest in being more involved. For the past 3 years, your local unit leaders have been there for you. Please thank your current officers for their dedication and service over the years. Some of the officers have decided not to run again, having been your leaders for many years and are looking at the possibility of retirement. Many of them are willing to run for office again. Get to know them! Read more about your current officers here. Their contact information is available in the Officers & Nurse Rep tab or here. The negotiation survey is now open! As the first step, we need to know what is important to you as we prepare to go into negotiations at the beginning of the year. If you have any questions, feel free to contact WSNA Nurse Representative Carmen Garrison at cgarrison@wsna.org. The hospital has assured us that no one will be laid off in this process. If you have any questions, please feel free to contact WSNA Nurse Representative Carmen Garrison at cgarrison@wsna.org or (206) 491-9424. The vote was held today, Aug. 6. The votes were counted at 1 p.m. and witnessed by three OR RNs and Carmen Garrison, your nurse representative at WSNA. It was an overwhelming NO vote. The current LOU that is attached to your contract is still in force. Thank you to everyone for coming out to the vote and making your voices heard. We will keep you posted on next steps. Questions? Contact WSNA Nurse Rep Carmen Garrison at cgarrison@wsna.org. Congratulations and welcome to WSNA. The vote was a unanimous "YES" vote. Thank you to the negotiating team: Linnea Paull-Ferguson, Lynne Smiddy and Dani Butters for their dedication and hard work in negotiating your first contract with WSNA. December 7th at 4pm in Room H.
December 13th at 8am and 5:30pm in Room H.
December 14th at 10am and 5:30pm in Room H.
December 20th at 10:30am and 4pm in Room H.
Last chance December 30th at 8am and 4pm in Room H.
We need to hear from you. If you work in the OR or PACU, we need to hear from you before we can go forward to propose call opt out for nurses who are 62+ or have 18 years of service at CWH. Please complete the survey no later than November 14, 2016. This is a closed survey for OR/PACU RNs (not management) only. If you have any questions, please feel free to contact Carmen Garrison at cgarrison@wsna.org. Nurse Practice Committee is working on the break issue. There will be a survey to complete in order to help them with the assessment of breaks and documentation of missed breaks. It is imperative that all RNs complete the survey. It is also important that all RNs document their missed breaks. If you feel retaliated against for documenting missed breaks, please let one of your officers or your WSNA Nurse Representative know. We all know more nurses work fatigued without addressing some of the contributing factors such as missed breaks. Your diligence in documenting the missed breaks and completing the survey is the first step in addressing and resolving the problem. If you have any questions, feel free to contact your WSNA Nurse Representative Carmen Garrison,WSNA at cgarrison@wsna.org or (206) 491-9424 (cell). 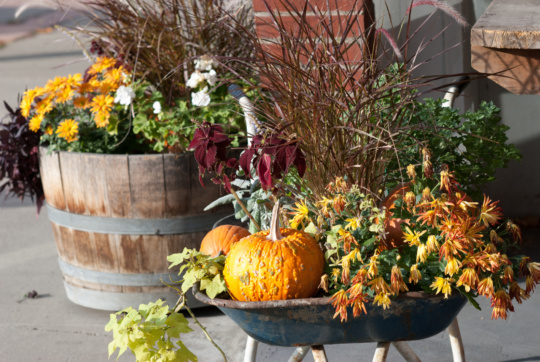 We are planning a WSNA local unit meeting for September, location and date to be determined. Stay tuned! We have a contract. The vote results were overwhelmingly “YES”. The signed contract will be available online hopefully within a month. In the meantime, if you have any questions, please feel free to contact Carmen Garrison, your WSNA Nurse Rep at cgarrison@wsna.org. For those of you who came early to the vote, we discovered a typo in the summary. It has now been changed online. The only change to the original summary you received is in Article 11: Health Program changes EFFECTIVE 1-1-14. “Effective 1/1/18, the Hospital may not raise premiums more than $15.00 per month.” Not $10 as stated in the original summary you were provided. Thank you to everyone who came out to vote. We had a great turn out. Here’s a summary of the changes in the new contract. Plan on attending one of the voting sessions on March 23. Members of your negotiating team will be available to answer any questions you may have about the changes. You can also review a redline contract during the voting sessions. Remember to thank your negotiating team for their hard work: Doug Landers, Susan Chapman, Lorna Sebastian, Judy McBride, Amanda Cortes, Elmo Ancar, Paul Molenaar, and Cheryl Keeler. We have a TA (Tentative Agreement)! A full summary of the vote will be available online prior to the vote. 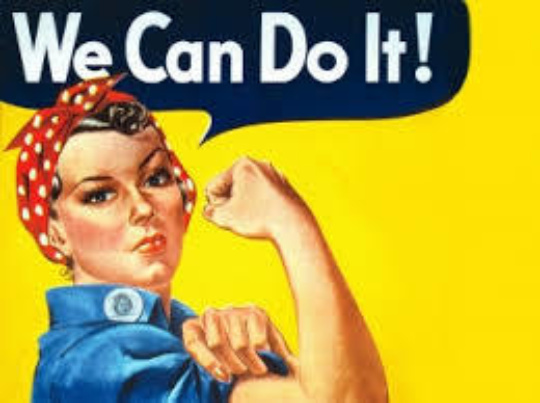 We fought off changes in the 401K employer contributions (retirement), got wages up to 2-2-2 (6% for the life of the contract), fought off losses in shift differentials for senior nurses, improved vacation language, improved insurance language (with commitment to negotiate changes), and much more. 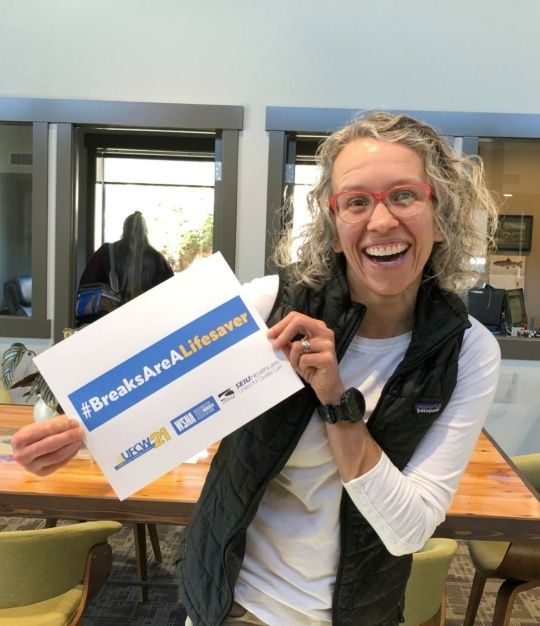 We had great dialogue during negotiations regarding rest breaks with a verbal commitment to truly get break coverage through a Nurse Practice initiative. Wear WSNA blue and WSNA button in solidarity! February 24, 2016: We completed our sixth session of negotiations with CFH (Confluence Health Administration). We have exchanged economic counter proposals. Less than acceptable wage increases. We are researching the CFH Health Insurance plan and negotiating details including more affordable premiums for spouse and family coverage. We have two more sessions scheduled on March 2 and 3. Please contact your team members in your department or your Nurse Representative Carmen Garrison (Cgarrison@wsna.org) and let them know what you think. We need you to stand by your negotiating team. It is important that you show support of your negotiating team members: Doug Landers, Susan Chapman, Paul Molenaar, Cheryl Keeler, Judy McBride, Amanda Cortes, Elmo Ancar, and Lorna Sebastian. Wear WSNA blue and WSNA button in solidarity! Follow us on Facebook. Like our page Central WA RNs Care for Us and invite your friends and family to do the same. We have agreed to work on a better vacation granting process. Both Administration and the Association have been working hard on a resolution regarding vacation and improvement of the current process. We have agreed to improvement on the layoff/restructure language. We have completed four days of negotiations. One and a half days (1½) consisted of presentations by administration regarding financials, health insurance, retirement, and seniority calculations. Administration has presented their interest in changing retirement, health insurance and shift differentials. We continue to negotiate these issues and others including wages. Our next two dates for negotiations are scheduled for February 23 and 24. It is important that you show support to your negotiating team: Doug Landers, Susan Chapman, Paul Molenaar, Cheryl Keeler, Judy McBride, Amanda Cortes, Elmo Ancar, and Lorna Sebastian. If you have any questions, you can ask your team members or contact Carmen Garrison at cgarrison@wsna.org. State of Nursing at CWH by Tracy Kasnic. We exchanged issues and interests and continued to bargain over wages, hours, and working conditions. If you have any questions, please feel free to contact your nurse representative, Carmen Garrison at cgarrison@wsna.org (you can also friend request me on Facebook – Carmen Garrison, BSN, RN). Your negotiating team members are: Doug Landers, Susan Chapman, Paul Molenaar, Cheryl Keeler, Judy McBride, Amanda Cortes, Elmo Ancar, and Lorna Sebastian. Please go to your local WSNA Facebook page to “Like” and “Share” with your family and friends: Central WA RNs Care for Us. Congratulations to the newly elected officers. They will be serving you for the next 3 years and will be on the negotiating team. Negotiations are set to start in January and a survey is available online for you to give us feedback. The current contract between WSNA and your local unit expires March 31, 2016. This survey is our first step in our preparation for contract negotiations. Your input is critical to determining our priorities as we head to the bargaining table. It is vital that we know your issues and concerns prior to the start of the negotiations. Please complete this online survey by December 8, 2015. Plan to attend one of these Local Unit Meetings on July 6, 2015. We know you face issues at work on a daily basis and we want to hear from you! 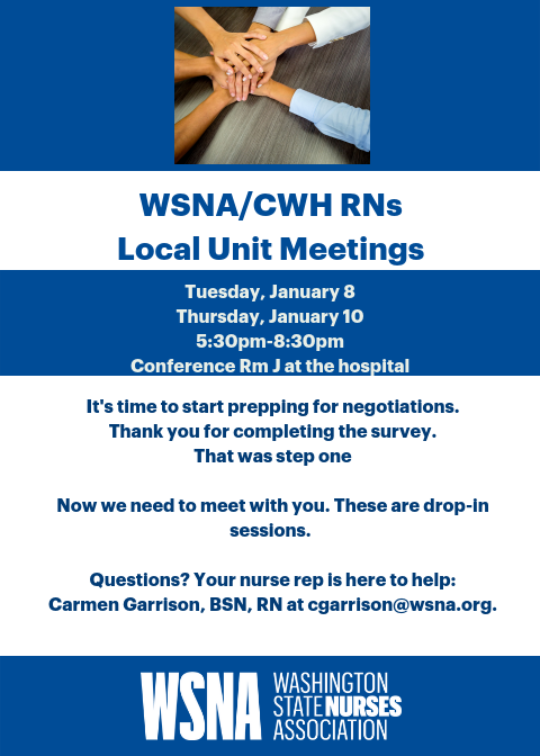 So please plan to meet with your officers and your WSNA Nurse Rep. We are rolling out elections, surveying our members about key issues, and planning for negotiations. For more information, it is really important that you plan to attend this meeting.